Town to have a look around. Up close this is much smaller than I first thought. The CBD is very built up and provides the skyline we are familiar with from TV etc. outside this area there is loads of undeveloped plots seemingly awaiting new builds. There are wall to wall shopping malls pretty much everywhere else. As our round the world trip continues West the malls have now acquired M&S, BHS and co. the snide market still flourishes and the Indians now meet you in the street and invite you to shady little shops upstairs or around the back alleys to sell snide gear. The hotel strip is as per the brochures and as we didn't have time we did not go in them I'm sure they are splendid and opulent. However there is always time to see the worlds tallest building, Burj Al Arab. All I can say about it is wow! The main CBD is all high rise and impressive but this thing is something else. It makes the rest of the city look like bungalows, even in the dust clouds that obscured clear views of it you could see its imposing shadow and it just seems to go up and up and up. Unbelievable, as we speak I'm confident that some other nation or sheik is planning a taller one, but this will take some beating. After an all too quick zip round it was back the ship for the overnight desert trip. 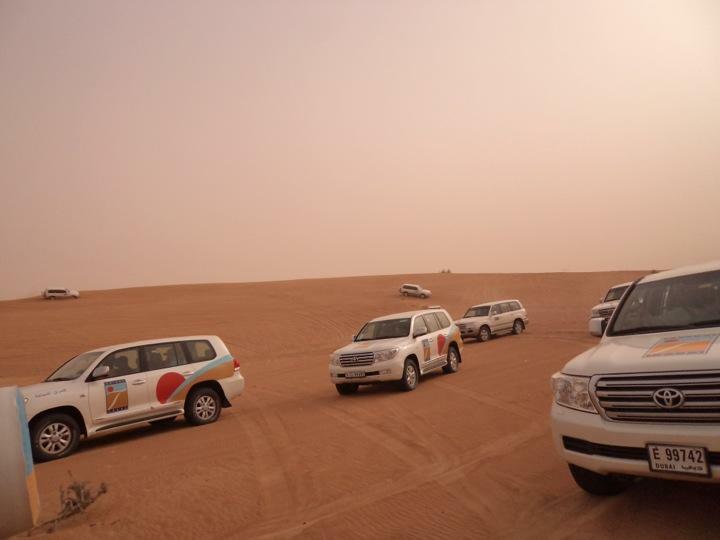 We were collected at 3pm In a Toyota Land cruiser and set off into the desert. An hour later we RV with a series of others on the same trip. The drivers partially deflate the tyres and we go off road. It was an absolute blast the car was almost on It's side several times and Wendy was looking a little more than green by the time we stopped. From there on to a camel farm, alas they had just been fed and so had little interest in us. Moving on through another hour of dune driving we arrived at our Bedouin camp. Well I'm not too sure the camp has ever seen any bedouins but it looked realistic. There it was time for a ride on A camel and a bit of sand boarding, followed by a smoke of the Hubble bubble pipe and a photo opportunity with a falcon. They then wheeled in The local Belly dancer and a whirling dervish dancer for a bit of local culture. I was so thinking of an Idiot abroad on the nile cruise at that time! This was followed by the less cultural but more familiar alcohol consumption. In turn this gave way to the sunset and a local meal (which is still troubling me considerably now some 16 hours later!). So it was the camels safely off to bed that the lights were pulled on the site and we slept in total darkness under the stars in the desert - and it didn't even get cold (apparently that was the protection offered by the sand cloud). It wasn't the most comfortable night and finding the latrines in pitch black and with some urgency was good sport. That said it was yet another unforgettable experience gazing at such stars as could be seen through the mist, notwithstanding the odd jet passing by overhead. Morning brought sunrise and the return of our drivers who had abandoned us to the wildlife the previous evening. They served up a light breakfast and it was off for another mad drive and a mid morning return to the ship.